One thing that I am always attracted with printed shirts is with those humorous words. It does make your day whenever you read someone wears them and cracks you up, especially when little adorable kids wear them. As long as it sounds innocent and with values, I can bear with that. Just like this shirt, I found for my son, I got the shirt at one of my favorite stores here, which always brings smile on my face. Aside from the fact that it is true, it is also an eye catcher. He wore this shirt last fall 2013 when it was nice outside to hang around, although the wind chills doesn’t help to warm up the environment we still enjoy the sunny day. Yours truly of course took advantage for my son’s nice and amusing shirt so I can feature it in this blog. Yes, for children this humorous shirts. Actually, there's lot of these shirts available at the market. 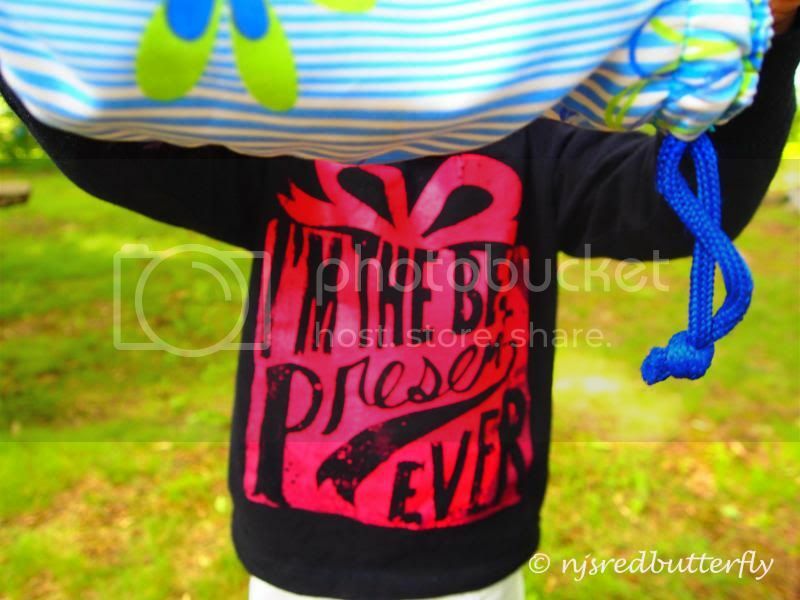 cute shirts for the little ones are always a hit. I once got my nephew a shirt that says "here comes trouble". he's so naughty that's why. Oh this always crack me up ! Actually we filipinos are " gaya gaya " but very creative we really have to be proud of that . I am 23 years in fashion industry and with all these really nice printing designs some of them really very nice and some of them are funny., Also some of the you will ask ??? like this city where I am now. "Phnom penh hard rock caffe" or saigon hardrock caffe .. or even worse Starbucks Phnom, penh is it not crazy ? theres nothing of all of that here. !!!! but the best is " they have this t-shirt it says " Same same but different "" so if a friend who would call or ask me . Hi How are you ? I would always say " same same but different " But this t-shirt sale liek hot cakes among tourist ! It's crazy to say this but I plan of having my own brand line of clothes starting with painted shirts and simple yuppie polo shirts. I hope this idea will be launched this year. Reading some fashion stuffs on blogs inspire me to create my own line of RTW's for the young male market. Totally! I remember having a shirt but I forgot what's written, but it's like when you read the lines in the front part of the shirt, you would really wanna see the back. :D Some people are just really creative. I love it too!